When a recent survey asked customers to dish about their worst experiences eating out, an overwhelming majority of diners told Consumer Reports that poor service was one of their biggest beefs. You don’t need a survey to tell you how important good service is. We all know how annoying it is when service is slow or the waiter gets something wrong. And it’s not, of course, limited to restaurants—poor service can kill any customer experience. But the Consumer Reports survey provides an important wake-up call for managers and business owners. The customers they asked overwhelmingly reported having faced not just slow service, or even incompetent service, but rude service. 72% pointed to “impolite or condescending servers” as the source their most negative customer experiences. Whether the source is employee dissatisfaction, poor people skills, or simply insufficient training in how to communicate with patrons, a negative interaction with staff can kill your customer’s experience, and tank a business’ reputation. If a customer has a complaint about the service they’re getting or a concern about a staff member, voicing that reaction will be awkward to say the least. Would you express dissatisfaction to the server who’s about to be alone with your food? Then you’re a braver man than I am, Gunga Din. Most customers will simply never feel comfortable speaking up when staff are the source of their complaints. The result? 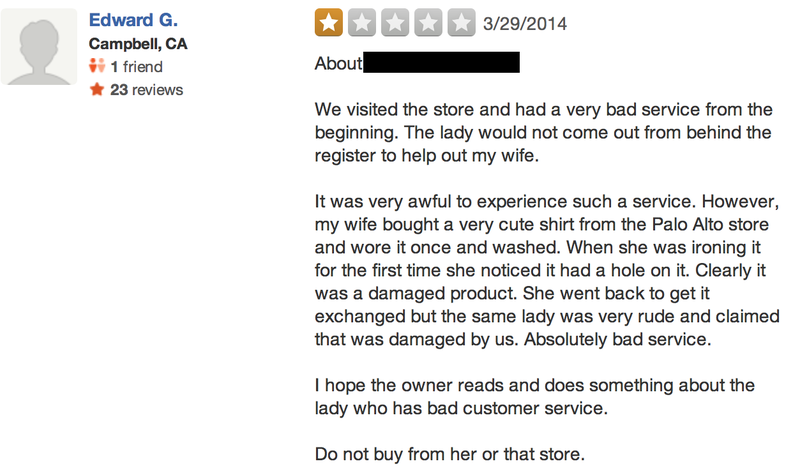 Customers can’t see any way to express their concerns other than posting a negative review online. Whether real or imagined, the indifference this customer perceived in the attitude of the manager certainly didn’t inspire any confidence that on-site staff would respond to the customer’s needs. The result? Instead of trying to resolve his problem by talking to the leadership team, Oliver was left venting his frustration on Yelp. Once again, a problem employee leaves a customer wondering whether there’s anyone he can trust to resolve his issue. Ultimately, this outcome is bad for everyone—the customer is left unsatisfied and the brand takes the blame for the bad behavior of a single employee. So what’s a business owner to do? Customers need an outlet to voice their questions or concerns in a forum that is direct but anonymous—they may be too embarrassed (or too disillusioned!) to speak to management personally, but they still need to know that their issue will be heard by someone in a position to do something about it. Don’t leave your customers hoping that you will see an online review. Giving them a direct line of communication to the head honcho gives them the confidence that their concerns will be heard by someone who cares. Not only that, it gives you the ability to connect personally with more of your customers and to find out what’s really going on with your staff—even when you can’t be present at your place of business. The hardest problem running my business is service consistency. When I opened a second location, that’s where it got extra difficult.